The next Open Meeting of the Coastliners Rail User Group will take place on Thursday 5 July 2018 at 7.15pm in the Reading Room of The Athenaeum Club. Church Street,, Hartlepool. The room will be available to us from shortly after 6.30pm and we will be welcome to use the bar until it closes not long after 10.30pm. All welcome. The meeting will take the form of an open discussion with the principle topics being the consultation on the coming Cross Country franchise & feedback on a 3rd July meeting between our Chairman and one or two other delegates with Steve Payne of Tees Valley Combined Authority. We must respond to the Cross Country consultation by 30 August and Coastliners members will have the opportunity on 5 July to help shape our response. Must all Cross Country services run via Darlington or could some of their trains serve Teesside and the Durham Coast? Should we oppose the over-simplistic notion that Darlington be considered to be the ‘railhead’ for Teesside and the Coast? 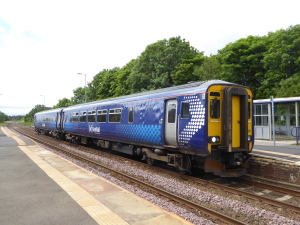 A ScotRail class 156 Sprinter can now regularly be seen on the Durham coast Having worked into Carlisle from Dumfries it then forms the 0803 to Nunthorpe before returning to Hexham . It is seen here at Seaton Carew working the 1118 Nunthorpe to Hexham. There has been much adverse publicity over the past few days over Northern’s timetable difficulties, often with little explanation of the causes. Whilst these problems are largely confined to the north-west with little relevance to the Durham Coast, the following statement from Northern’s MD provides some background. As you know we have been experiencing some significant disruption to train services, especially around north Manchester, Bolton, Liverpool, Blackpool and up to the Lake District. I’d like to apologise for this unacceptable situation and for the disruption and inconvenience many passengers have faced. We’re truly sorry for this and we’re working hard with the Network Rail team to fix this. To deliver a more robust and stable service we are introducing an interim train timetable, effective from Monday 4 June. This interim timetable will enable us to start to stabilise service levels over the next few weeks and, importantly, start to reduce the number of last-minute train cancellations. In the short-term, until the end of July, we will be running fewer services, but still more than we did before the May timetable change. We will then get back to a full timetable service. This interim timetable will see us reduce the number of train services we run each day by 6% – that’s 165 services out of our normal 2,800 daily services and will enable us to focus on delivering the essential driver training we need to complete. Whilst this means a temporary reduction in service in the short-term in some locations, this is an important and necessary step to allow us to start to stabilise the service, and start to give customers more certainty about our advertised services. During this interim timetable period we will be intensifying our driver training programme, alongside ensuring efforts are redoubled with Network Rail to get outstanding infrastructure completed on-time. Details of the short-term train service reductions are given below. One area I wanted to clarify is the position on train drivers, and to explain that we actually have more drivers than we need to run a full timetable in normal circumstances. We currently have 1,529 train drivers, 180 more than when we started the franchise. Lakes Line: For an initial period of two weeks, we are removing all services on the Lakes Line to and from Preston, Lancaster and Oxenholme and will, instead, operate a replacement bus service to keep people who live, work and visit the Lake District on the move. Blackpool: In and around Blackpool we are reducing services between Blackpool South and Preston, Preston and Colne and will remove a small number of off-peak services between Blackpool North and Manchester Airport. Other services between Blackpool North and Manchester Piccadilly will start/terminate at Manchester Oxford Road. Lancashire: There will be reductions between Ormskirk and Preston and a small number between Blackburn and Southport via Manchester Victoria, whilst many services on the Lancaster to Morecambe line will be removed. Manchester: We have reduced services on the Kirkby to Manchester Victoria line via Wigan, and the number of trains operating each day between Manchester Victoria and Stalybridge. Liverpool City Region: Additionally, as already extensively communicated, there is a closure of Liverpool Lime Street for two months whilst significant work takes place on re-signalling and remodelling of the infrastructure. We have reduced services during this interim period as a result of this closure. This will see three trains per hour run between Liverpool and Wigan/Manchester Victoria. On a number of these routes there will be alternative rail services available, as well as other modes of transport. Where available, rail replacement buses will also operate on affected routes with details provided locally for customers. As said above, as a result of these amendments we will be operating 165 fewer services each day – equivalent to 6% of our daily total. We will be communicating these changes to all of our stakeholders, national and regional media, and customers. The train times during the interim timetable are available now through National Rail.co.uk, Trainline.com, Northern’s website and other websites and apps. We will be encouraging customers to check before they travel in those areas where train services are changing in case there is any change to their particular train service. Network Rail and Northern announced last week the commissioning an independent report into the preparations and processes leading up to the implementation of the recent timetable change. Customer groups, transport and Northern stakeholders will be invited to contribute to the report. Northern is committed to delivering the biggest modernisation programme in a generation, including 98 new trains that are now under construction, all the Pacer trains will be retired and all remaining 243 trains will be refurbished to a high standard. All of this will be completed by 2020, providing an additional 2,200 services per week. Again I would like to apologise on behalf of Northern for the unacceptable service many customers have been subject to. We are absolutely committed to resolving the service issues, and the interim plan will help ensure we start get back on track and start to give customers more certainty around the services we operate. I will ensure that you are kept up to date regularly with our progress.